Here are cheap deals for the Obelisk RDA by Cartel Mods. 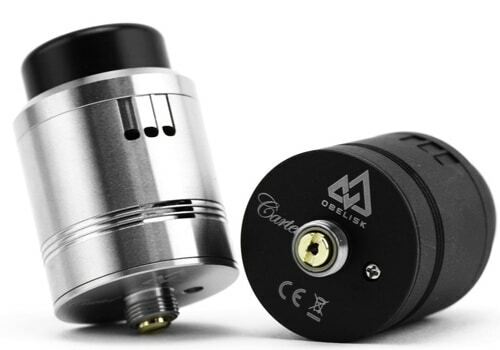 The Cartel Mods Obelisk RDA has a 24mm diameter and is made from stainless steel or with a ceramic black finish. At the bottom, you will find a gold plated brass connection pin that is hybrid safe and there is also a squonk pin included with purchase. Airflow on the Obelisk is adjustable at both the top and bottom and is said to be completely leak proof. An 810 Delrin drip tip attaches at the top, but you may also use your own mouthpiece with the included 510 adapter. Underneath the chuff cap, you will find a quad post build deck that features PEEK insulation. Installed builds are held in place by use of flat head screws on each post. A 5mm juice well can be found underneath the deck, which is deep enough to prevent the need for frequent dripping. With purchase of the Cartel Mods Obelisk, you will receive a wide bore delrin drip tip, a 510 adapter, a squonk pin numerous o-rings and a triple pronged screwdriver that works with 2.5mm flat head screws, 3mm flat head screws and Phillips head screws.